This is the third part of a series exploring how to unit test classic ASP code. In part one, we explored the motivations behind this series and in part two we examined a scenario that will give us context when discussing the framework we are building. In this part we start building a classic ASP framework that will enable us to test new VBScript/ASP code that we are writing and to facilitate this we create two projects - a C# website project that represents our ASP site and a C# class library project for our unit tests. 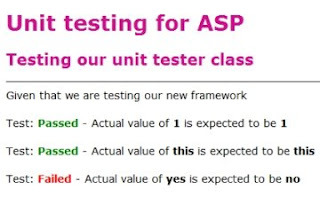 Note that the Unit test project needs to be nested within the ASP site so that ASP test pages we write can access the classes of main site in the same site and context. The image shown here has the nested project location highlighted and we will therefore be accessing our testing pages with "(wesbite)/UnitTest/ASPTesting.Tests/". Our first thing to address is how we will encapsulate the code that we are writing, enabling us to test code in isolation without unnecessary overhead. We will achieve this through VBScript classes and objects with one ASP file per class - these files will sit within the main ASP site and through server side includes we can use those classes / objects in both our main site ASP pages and in our test ASP pages. But how will we test these isolated classes? Let us start with creating a UnitTester class that we can use as the base of our framework and we save this in the root of the ASPTesting.Tests project. We will want this class to emit HTML based on assertions that we make in ASP test pages that we will be calling manually; we therefore want to make this user friendly and able to provide context about the tests we are performing. 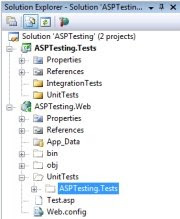 We can now set up a test page that uses this class directly - we have a UnitTest folder in our ASPTesting.Tests project and we place our first ASP test file in there (Test.asp). Note that we have also set up a virtual directory called "Tests" that points to the root of the ASPTesting.Tests folder, enabling us to use a virtual include. WriteTest areEqual, ("Actual value of <b>" + sActual + "</b> is expected to be <b>"
We have added a Given() sub-routine that will enable us to provide context to a series of assertions we are making and we have a new private sub-routine called WriteTest() that facilitates the writing of the test result - it will give us a "Passed" or "Failed" message each time it is called. Finally we have our first assertion function that tests the equality of two values and calls the private Write Test routine to emit the HTML result. In the next part of this series we will examine how to automate this test using NUnit so that we need not manually call our ASP pages directly every time we write a test. We will then proceed with our example requirement and show the unit test framework in use whilst adding new assertion functions as we need them. where's the next section? This is really cool. more test first development - classic asp. Unfortunately that was the last part of the series as I no longer work with an asp codebase. Good luck!